I would have to call this my first success with a yeast bread. It's my second yeast bread ever (I'm not counting Claudia Roden ataïf because they didn't require much). And I consider this one a success despite the split seam on the top where the raisins are peaking through. The loaf rose properly, it baked up, turned brown and it's delicious. Besides, the cracking adds character, right? And I don't mind if my raisin bread is literally bursting with raisins! 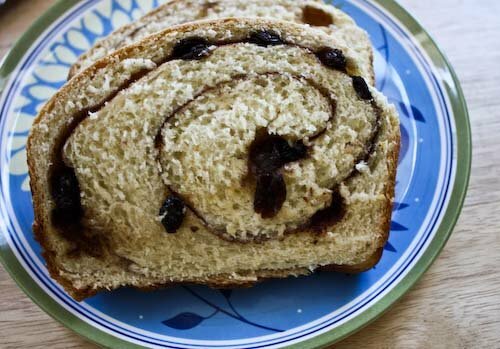 Raisin bread is a favorite around here, which is why it's been on the to-do list for a while. We've been known to plow through a loaf in one day, even if it is normally the store-bought kind. This bread smells so wonderful while it's baking up, I gave it less than 24 hours before it was gone and I was just about right. This is another one from Baking from My Home to Yours, and although Dorrie suggests using it for French toast, or at least for toast, we just didn't have enough self-control to save it for breakfast. Now I'm really regretting that greedy move. Oh well, I'll just have to make it again! 3 tablespoons butter softened so it's spreadable. Put the yeast in a small bowl, add a pinch of sugar and 1/4 cup of the warm milk, stir it together and let it rest for 3 minutes. It should soften. In a stand mixer with a paddle attachment, combine the rest of the 1 cup milk, the butter and the 1/4 cup sugar. Mix on low speed until combine, then add the salt, egg, vanilla, zest and nutmet and continue to stir on low for another minute. Add the yeast mixture and stir for one minute more. With the mixer off, add 2 3/4 cups flour and begin mixing again on low speed until the flour is just worked in. Switch to the dough hook and with the mixer on speed setting 2 beat the dough for a few minutes. The dough should begin coming together off the sides of the bowl. If it doesn't add up to 1/4 cup flour on tablespoon at a time until it does. Kneed the dough for 3 minutes more until it is smooth and shiny. The dough should be very soft. or freeze for 30 minutes. For the filling: Combine the sugar cinnamon and cocoa powder. Remove your dough from the refrigerator/freezer and on a lightly floured surface with a lightly floured rolling pin, roll the dough out to a 12/18 inch rectangle. 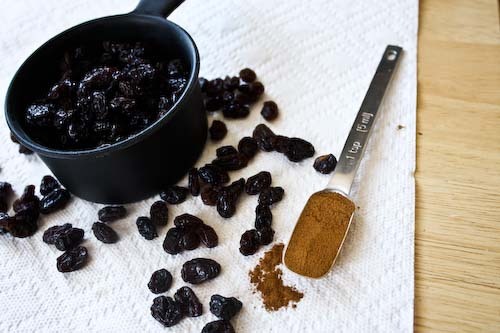 Using your fingers, spread the butter on the bread, then sprinkle with the cinnamon/sugar mixture and finally spread the raisins in an even layer. Butter a 9x5" loaf pan. Roll the dough snugly, beginning with a short end. Place the dough seam-side down in the loaf pan and tuck the ends under. Cover with a sheet of parchment or wax paper, put in a warm place and allow to rise for another 45 minutes or so. Preheat the oven to 375. Once the dough is risen, brush the final tablespoon of melted butter over the top, place on a baking sheet and put on the center rack in the oven. Bake for 20 minutes, then place a piece of tinfoil over the loaf and continue to bake for about another 25 minutes. Allow to cool in the pan for 5 minutes, then transfer to a cooling rack and bring to room temperature. Since I finally made a yeast bread, I can finally send something in to Wild Yeast for Yeastspotting!! 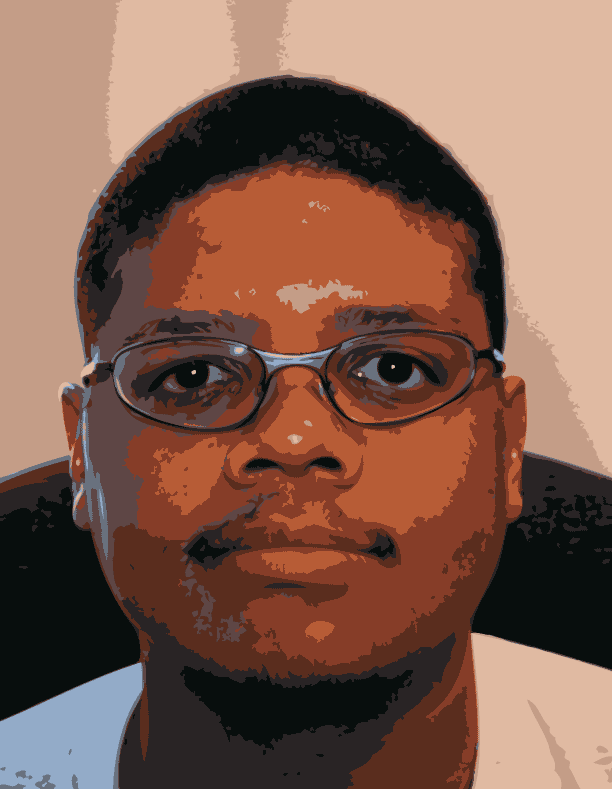 So be sure to check out this week (or next week's, I'm not sure if I'm on time for this week's) edition! This looks great with that spiral pattern. This bread would be really good for breakfast. ohh this looks so good! i love warm cinnamon swirl bread toasted w/ butter. never made it myself though, so i may have to try this out! Really good work. Cracks and exposed raisins are things that you have to experiment with to remove or accent the right way. Some people go for the aesthetic. I am sure there are factions on both sides. From the size of the cavities, you would get better absorption of any custard for french toast. You are probably looking at a better result since you are not waiting for the bread to go stale. Andrea, thank you for stopping by my blog. I like yours a lot! Great recipes and pictures. Cinnamon raising bread is one of my favorites. Loved the way looks! I wouldn't get too hung up over any cracks because that loaf truly looks excellent and the swirl really gives it a nice touch. Great work! Really lovely swirl in that bread! Thanks for sending this wonderful loaf to YeastSpotting and I hope you'll be baking a lot more with yeast. Also, for some odd reason I never realized I could submit bread photos to yeast spotting (guess I never read that closely...just perused the lovely pictures each week). Thanks for cluing me in! Thanks for the sweet comment! :) This bread looks amazing. Cinnamon is one of my absolute favorite flavors, & the cinnamon breads at the store sometimes aren't all that impressive. This is so so much better! Thank you! Ever since I saw the Pepperidge Farm ad for cinnamon swirl bread I've wanted to find a recipe to try this. I'll probably do it this weekend. Thanks again. Do you think it could be made by hand without a stand mixer? Yum! 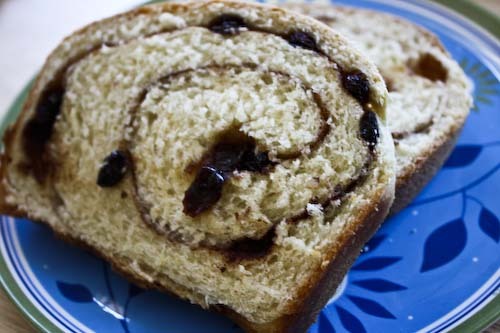 This looks soooo good, I love cinnamon raisin bread especially dusted with icing sugar... I have to go make this! Thanks Sam! Unfortunately we got greedy and ate the entire thing in one day! Hi Carmen, I found this recipe to be surprisingly easy for a beginner bread-maker like myself. Noctrni, thanks for the tips! I'd love to hear about your experiments with bagels! Farida, thanks for stopping by, I'm a huge fan of AZ cookbook and had actually been visiting for some time before I left a comment. Thanks Susan, I plan on exploring bread baking much more in the future. I don't have any excuse not to with Wild Yeast as a resource! Micha, I know, don't you just love YeastSpotting! Definitely let Susan know when you have something for her to include! I'd love to see the event grow even more. Sarah, I couldn't agree more, cinnamon bread from the store can be totally insubstantial. This one was much more filling (which didn't stop us from polishing it off anyway). Hi Maggie, unfortunately you do need a mixer for this one. The dough is super wet and you wouldn't be able to kneed it by hand. I'll keep my eye out for a cinn. bread you can do by hand, though! Hi Hayley, I should have thought about icing sugar! That would have been great. Next time! 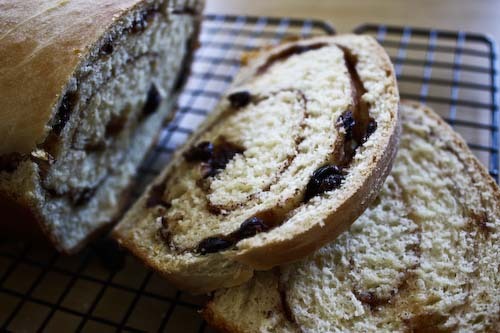 I have never made raisin bread before, but this makes me want to make some this weekend! Your bread looks amazing. 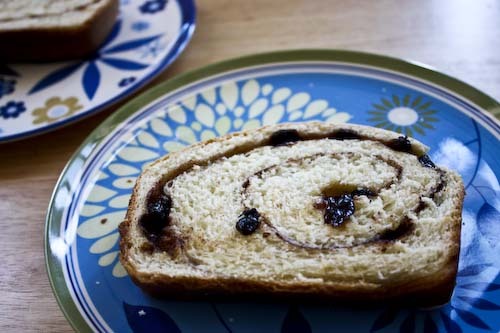 I just adore cinnamon raisin bread! I'm such a sucker for cinnamon raisin bread -- especially toasted with butter. My mouth is watering. Thanks for the great posting! Your raisin bread looks awesome and I love your tip for the best ever banana bread. My family eats bananas so fast they never go brown. I guess I'll have to hide some. Iam drooling over. Bread looks awesome. First time here. You have yummy recipe blog. Will visit again. Well done on the swirl! I'm suitably impressed (my swirls are rarely beautifully curved the way yours are). I like the idea of the cocoa powder in the filling. Next time I make banana cinnamon buns, I will have to add cocoa to the cinnamon/sugar/butter mixture! this is looks good!cinnamon is the best!